Health. It’s well-established that health and satisfaction are inextricably linked: healthier retirees are happier retirees, according to a 2005 study by the Center for Retirement Research, which supports this blog. One reason health is important is that retirees who are healthy can remain active – bridge, golf, travel, volunteering, whatever – which brings satisfaction. But health cannot explain the decline in satisfaction, because rising longevity over the past three decades indicates that retirees are, to some extent, healthier than they once were. Age. Research shows that older retirees – over age 70 – are happier than the youngest retirees, a finding that EBRI’s survey analysis confirms. One explanation could be that younger retirees often have left the labor force prematurely due to poor health, stress, or unemployment. Shifting demographics might play a role in declining satisfaction over time. As the baby boom bulge enters the retirement pipeline, there are more younger retirees. And boomers are pulling down the average retirement age – the oldest boomers, born in 1946, were just 66 in 2012, the final year in EBRI’s satisfaction report. Money. A third factor is a retiree’s economic well-being. Academic research does show that wealthier retirees are happier. EBRI said that 72 percent of retirees in the top quartile, ranked by asset levels, report that they are very satisfied, compared with only 33 percent in the lowest quartile. The form that money takes could be important. Fewer retirees today have traditional pensions that pay a fixed monthly benefit. Social Security benefits are also replacing a declining share of American households’ pre-retirement earnings, due to the program’s rising full retirement age and the decline in spousal benefits received by married, working women. The 401(k) has replaced defined benefit pensions, shifting the financial risks – and the onerous to save – over to the typical worker. There are no hard and fast rules for why some are satisfied with their retirement and others are dissatisfied. But this blog should give retirees and future retirees something to think about. 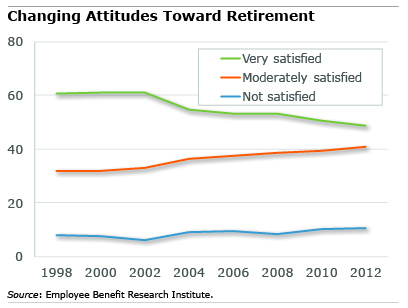 What are your thoughts about what makes retirees feel satisfied with their lives? Please share them in the comments section below. I believe that retirement should be a form of refirement and not retirement. I have been in an encore career of teaching for 10 years and it is a form of satisfaction like none other that I have ever had. Seniors have so much to give back in terms of knowledge, experience, mentoring, and role modeling. Flex time is also important for seniors as it allows for time to do other activities such as travel, sports, reading, art, writing etc, but the real satisfaction comes from helping others work towards some of their dreams. Legacies are made of what we do for others as what we do for ourselves is long forgotten. Well said, Kent! I couldn’t agree more. I am newly retired, and still ‘sampling’ all kinds of volunteer work available in my great NYC. The opportunities are endless, and I am slowly focusing on those areas which give me the most satisfaction. I have also discovered that, 1) people who volunteer are generally very nice to be around, and 2) ‘thank you’ – that ‘costs-nothing-but-seldom-used’ phrase in the working world – abounds in the world of non-profits! I’m age 69 and have been listening to retirees comments and reading about retirement life. Most of them are busier now than before retiring. They enjoy being busy by choice. They feel they are contributing to something worthwhile. They feel appreciated and needed. They have a purpose in life, so they have to get out of bed every morning because someone is counting on them. Retirees must find a personal mission. It may be by trial and error. But they must find a purpose to live. I, too, enjoy the freedom of retirement, having discovered a passion for birding just after retiring. However, money is a problem, despite having mastered the art of not shopping and utter frugality. I have no pension or 401(k), having worked for nonprofits, so it’s just my own IRA savings and Social Security. The index used for SS COLA needs to be revised to include property taxes. Despite lower oil prices (I heat with wood), the two primary upward pressures on my savings are property taxes and health care. NH property tax abatements for elderly permit up to $35,000 in savings/assets, so for those of us with no pension and a need to supplement SS, there is no property tax abatement possible until IRA savings and other assets are below $35,000.